Oven grates are largely ignored yet are subjected to the spills and splatters that inevitably occur when cooking. If the oven grates are clogged with bits of burnt-on food or are coated with a sticky, oily film, then time, patience and a lot of scrubbing with a good brush and a grease-cutting cleaner is the best way to return them to their former gleaming glory. An easy way to clean oven racks is to pop them into the dishwasher. If placing them in the dishwasher vertically, be sure that the machine is tall enough so that the racks don't hit any spinning arms inside the tub. The oven grates can be overlapped if you can place them horizontally in the dishwasher. The bottom rack is preferable for seriously grimy oven grates. If the dishwasher didn't clean them thoroughly, you can try a few other things to get them looking as good as new. Although it is stinky and can irritate sensitive noses, ammonia cuts through grease and baked-on grunge quickly. First, try hosing down and scrubbing the oven racks. If they still aren't up to your standard of clean, then a long soak in an ammonia-based bath can help. Use a thick garbage bag and fill it with a quarter cup of ammonia. Tie up the bag and leave it overnight. In the morning, wipe down the racks and give them a good wash. When working with ammonia, you may want to use a face mask, safety glasses and gloves, particularly if you are sensitive to strong smells. The fumes from ammonia can irritate eyes and noses. Skin can get irritated when it comes in contact with ammonia that may splash from the container. Be prepared ahead of time to get the job done quickly and cleanly. Take the grates outside if possible and hose them down as a first step. A high-powered hose can remove sticky bits from the surface of the grates. A quick scrub with a sturdy brush can whisk away leftover globules of goo. Once the grates have been prepared for scrubbing, don a durable pair of kitchen gloves. This will keep fingers from getting snagged in between the grates, which can get slippery when they are wet. Have a bucket of warm, soapy water handy for dunking sponges and scrubbers. 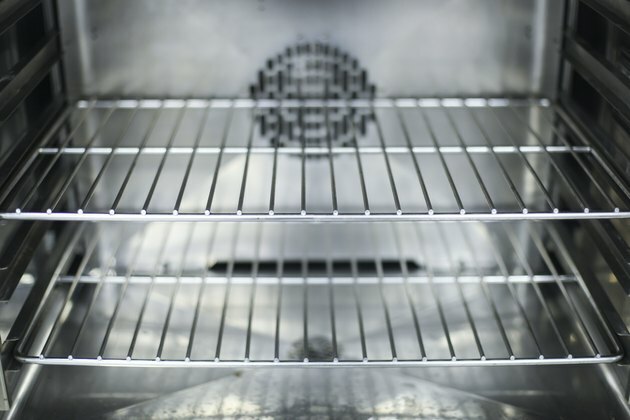 The best way to clean oven racks without chemicals is with a homemade cleaner. Pair that with a fine-toothed scrub brush that can get into the nooks and crannies of the wire rack, and you can get the grime off the grates rather easily. Submerge them in a tub with dishwashing liquid and warm water overnight. Place them in a shallow tub or plastic swimming pool and sprinkle baking soda over them before dousing them with vinegar. Line a bathtub with dryer sheets and place the racks directly on top. Fill the tub with water and add a half cup of dishwashing liquid. Let it set overnight, and the racks should be clean enough to simply wipe down. When cleaning the oven grates, it's a good time to clean the oven as well. If the oven has a self-cleaning option, this can greatly reduce the amount of time and energy you will have to put in to clean the inside of the major appliance. The self-cleaning option on an oven may be tempting, but it's not for oven racks. When the oven is set to self-clean, it heats the oven to 900 to 1,000 degrees. This makes the globs of fat and layers of grease that have collected on the inside surfaces of the oven turn to ash. The oven racks need to be removed before the oven is put into self-cleaning mode. This hours-long process will make cleaning the oven much easier. Have kitchen gloves, a good bucket with warm, soapy water and a brush to sweep all the ash into a disposable bag. Can You Clean Grill Grates in a Dishwasher?